The plan was simple, the orders had come and all they had to do was to execute it. 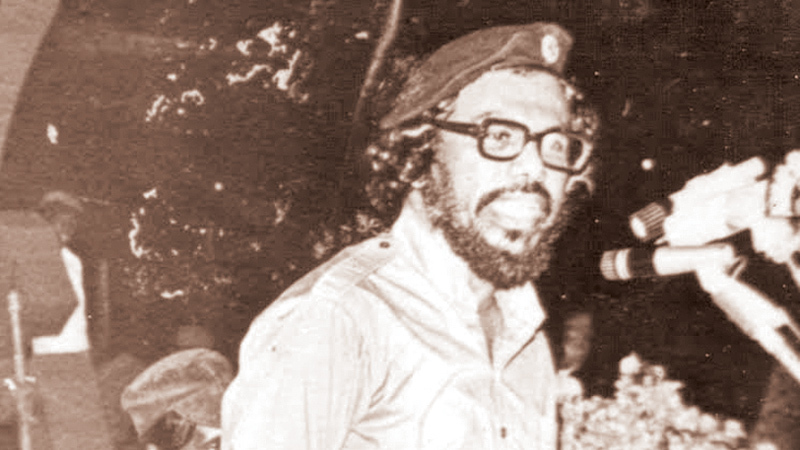 Rohana Wijeweera, the charismatic leader of the JVP was in prison in Jaffna, and via a message sent through Lal Somasiri, he had asked that, “Posters should be published and leaflets distributed calling for his release, and in the case of an attack, 500 comrades should be sent to Jaffna to secure his release.” He had also stated, “If you cannot obtain my release legally, you may create an island-wide struggle throughout the country and then send 500 men”. As decided and commanded by their supreme leader, JVP activists on April 5, 1971, attacked 74 police stations within 24 hours. In the span of two to three days, they would also managed to seize power over 35 police station areas, control of over 50 chief towns, and attack close to 92 police stations with 57 damaged. The state which was caught very much unprepared took time to strike, but when they did, it was the first time the State took action to quell an armed struggle of its own citizens since Independence. Official records show that 5,067 were taken into custody, 53 security forces died and 323 were injured, 37 policemen were killed, and 193 injured in police stations. The JVP in turn killed 41 civilians, but overall rough estimates suggest that between 8,000 - 10,000 people died during April of 1971. The government at the time estimate that the cost of the damages caused by the 1971 revolution amounted to over Rs 20 million. Today, as we mark the 46th Anniversary of the 1971 JVP Revolution, both the nature of the JVP as well as the Sri Lankan state has changed form, but the core problems which led to the 1971 revolution still remain. Statistics from the Central Bank in 2012/2013 show that 77.4 percent of the population of the country lived in rural areas while 18.2 were in urban and 4.4 lived in the Estate sector. Agriculture, which was one of the main sources of income in the rural sector, today only contributes 7.7 percent to GDP, while employing 28.5 percent of the population (2014). Thus, the mean income per household per month in the urban sector was recorded to be Rs. 69,880 in 2012/2013 while it was Rs. 41,478 in the rural sector and Rs. 30,220 in the Estates. A large proportion of the GDP—42 percent—also comes from the Western Province which has undergone progressive urbanization over time. When it comes to education, the 2012/2013 statistics showed that 20.5 percent had passed A/Ls in the urban areas, which had the best schools, while only 11.1 percent managed to pass their A/Ls in the rural sector, with the Estates trailing behind with 2.2 percent. The situation for the youth in the rural sector was no different in 1971. Revolution it was to be. The plan to capture State power through the attack of police stations was simple according to Gunaratna’s book. Add to this, there were grave instances of miscommunication between various group leaders of the JVP around the country leading to the attack being carried out at the wrong time. All activists on the ground were sent the telegram “JVP Appuhamy expired. Funeral 5”, which called for the attack on April 5 night. “The message sent by telegram was misunderstood, and the JVP activists in Moneragala prematurely attacked the Wellawaya Police station in the morning,” noted Gunaratna. Police officers, tipped off about the attack, were soon on alert when the Wellawaya station was attacked, and all other stations around the country were immediately put on alert. The security forces and police though, were caught full unprepared to deal with such a situation. Gunaratna’s book showed that they were, “Ill-equipped and did not have a proper ground intelligence system and did not take seriously the intelligence reports of the earlier government about a JVP attack.” That they also assumed that a “bunch of village boys could never overthrow them”. As the State geared itself to deal with the first of many of revolts to come, it was also the time when Prime Minister Sirimavo Bandaranaike put to good use all the good faith she had won in the international community and sought help from neighbouring countries such as India and Pakistan to get troops to assist the government. The JVP had four important missions to execute: Attack the Panagoda army camp, kill or abduct the Prime Minister, ministers, and senior government officials, capture Colombo, and rescue Wijeweera from the Jaffna prison. None of these bore any fruit. According Gunaratna, the cadres at the bottom were not prepared or briefed properly on how they were to set about getting these tasks done. Moreover, the little success they did achieve when capturing large areas of land in the South on April 5, were short-lived as many did not know how to consolidate their positions. “The JVP was a cadre party and had limited public support. They were a group of handpicked and highly motivated young men who thought narrowly and had certain ideals,” said Gunaratna in his book, “They believed in this revolutionary ideology of the JVP and were prepared to do whatever their leaders ordered. Further, the JVP activists who managed to control large areas of the country following April 5 did not know the next step”. “As the public watched the young JVP activists struggle with no direction, many soon lost faith in the maturity of the party,” said Gunaratna. More importantly, the JVP had overestimated the strength and capability of the student sector. “From schools and university, they were highly indoctrinated and were prepared to sacrifice their lives, however, they were only equipped with a bomb or two and were inadequately trained and lacked strategy and direction,” he added. While it was a wake up call for many in government and society at large, the revolution was a failure of epic proportions for the youth who had fought in it. The media, which was highly censored during the revolt, later on reported that, “About Rs. 450 million ear-marked for capital development in 1970-71 could not be spent due to these disturbances. The government, at the time, also said, “For so many thousands to revolt, something terrible had gone wrong,” and the Prime Minister herself stated, “We must remember that we are all sitting on top of a volcano today. We are unable to say at what moment this terrible volcano will erupt. Before it erupts and causes a great calamity, we need to take adequate protective measures to save ourselves from the impending disaster”. One important legislation they passed to deal with the insurgency was the Criminal Justice Commission (CJC) Act which would set about arresting and taking legal action against the JVP activists. A CJC was also recently proposed by the government to deal with those involved in large scale financial fraud. Bandaranaike’s government also appointed boards, commissions, organisations to look into the problems of the rural people and the youth and advocated reforms in education, etc. but nothing concrete happened. The problems were left to persist. When taking steps to break up the JVP, however, the government adopted the strategy of interrogating Wijeweera and breaking the confidence the cadres had in him. They also ran rehabilitation camps to wean off many JVP cadres from the party and then release them back into society. “In the 1971 investigation and the CJC trial that followed, the government adopted a strategy which was not adopted in the late 1980s and 1990s. The then government managed to convince most of the main suspects of the CJC trial that Wijeweera was a fraud. By doing so, they killed the popularity of the leader and to a large extent, the movement,” stated Gunaratna’s book. And truly enough, Wijeweera, during his interrogations, gave away names of JVP ‘A-listers’. As a result, less than five percent of the old members supported Wijeweera after 1971 and most retired from revolutionary politics. After 1971, the JVP as a party also scattered into many smaller groups; some openly against Wijeweera. Some of them also took to train themselves militarily, and after 1984, when proscription of the JVP made it hard for it to engage in politics, Wijeweera look for assistance from these parties to take up arms once again. Gunaratna also noted, “It was possible that the disenchanted north-eastern Tamil youth drew inspiration to stage an armed struggle against the state from the events of 1971.” It was also a signal of a greater calamity to come in 1987—the second insurgency of the JVP which was more violent and dangerous. “The rural sector was highly undeveloped, and it was the crisis in the rural sector that was a main contributor it. In addition, there were also caste conflicts, limited opportunities for education, unemployment, etc.,” said the Head of the Department of Political Science at the University of Sri Jayawardenepura, Dr. Terrance Purasinghe. “The traditional Left went into coalition politics with the SLFP to form a government, and with that, the revolutionary streak of the Left was buried. The youth had to look for an alternative movement and that is when the JVP came to being,” he added. More importantly, none of the main parties had room for youth voices to be heard. “The main parties like the SLFP and UNP still have no room for the youth; even when nominations come up, few are given the opportunity. Even now, there is very little interest in resolving the issues of the rural youth and the rural sector in general. The alternative should be the Left, but the Left movement is very weak and is still in coalition with the major parties,” Dr. Purasinghe added. In addition to not having an outlet for their voices, Gunaratna noted, “One of the key reasons for youth in 1971 and in the 1980s to rebel against established authority was a direct result of educated men being mass-produced out of a system not having jobs. If education was not made free overnight or was employment-oriented, this calamity would not have occurred”. Many of the socio-economic issues which persisted in the 1970s are still prevalent today, and the solutions put forward by Gunaratna in the 1990s are very much applicable to today’s context. He observed that many of the problems in the country were due to Sri Lankan leaders, instead of solving the problem at the initial stages, often allowed it to grow to acute proportions. Notable intellectuals spend time criticising leaders instead of solving the issues, Sri Lankan leaders always try to apply solutions based on western models which have had no effect on the local situation and the lack of planning of national programmes, be it education or employment. “The false sense of nationalism and patriotism has destroyed the country’s values, and this has, among other calamities, caused the absence of a national identity,” he noted, “All political parties should work towards a national future than towards their own narrow futures”. In the end, it was imperative that the Government addressed the deep-rooted socio-economic problems that led to such dissatisfaction while having the security forces prevent the resurgence of violence. “The 1971 revolution, as well as the failure of the 1989 one, showed us that social revolution cannot be brought forward through an armed struggle. The defeat of the LTTE proved that too. A social revolution can only be done through a mass struggle and that can be achieved in Sri Lanka,” said Dr. Purasinghe.